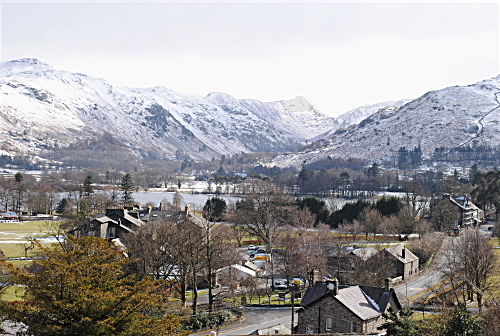 Glenridding, at the head of the lake, is one of the most visited spots in the area. It is the terminus for the Ullswater 'Steamers' that sail up from Pooley Bridge, has a concentration of hotels and other accommodation, and is an excellent starting point for many walks. 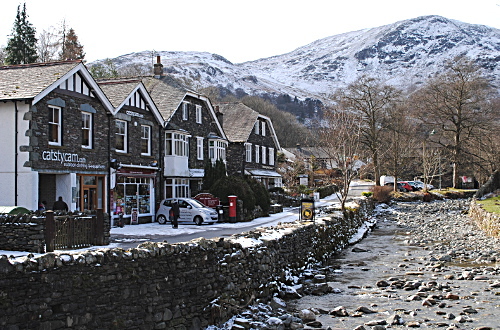 The photograph above shows the Glenridding Beck with a combination of shops and accommodation alongside it. 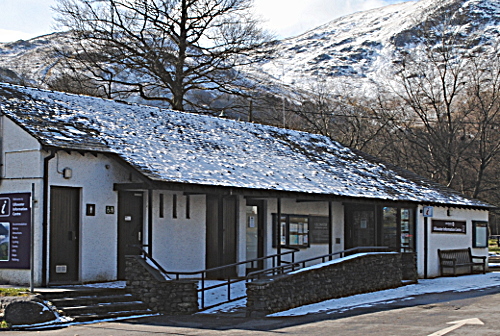 On the other side of the beck is a sizeable car park and the excellent Lake District National Park information centre. What most definitely is not excellent, however, is its visual appearance from this angle, and the blot on the the landscape is best kept out of the picture. It is a prize example of how official bureaucracies will allow for themselves what they would never permit for anyone else. However, we mustn't be too negative. Inside the building they do a good job here. Below is the much better view from the front.